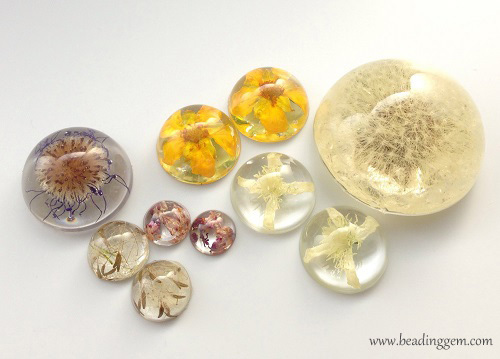 The Little Windows' large cabochon mold (which I received for review) can be used to generate a whole bunch of round resin cabochons in different sizes. I thought dried dandelion clocks and flowers embedded in these half spherical shapes will capture them in 3D fashion as opposed to flat pressed flower creations. 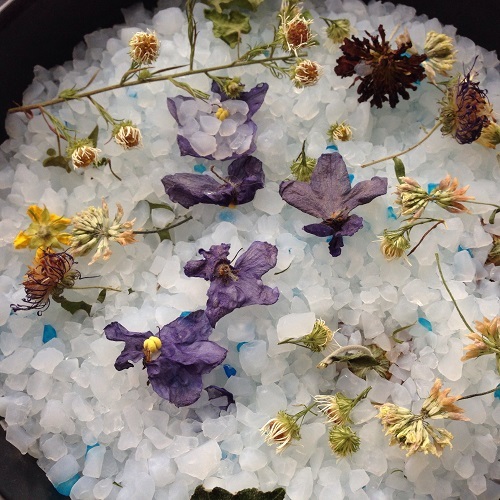 The flowers have to be dried because otherwise they will rot inside the resin. 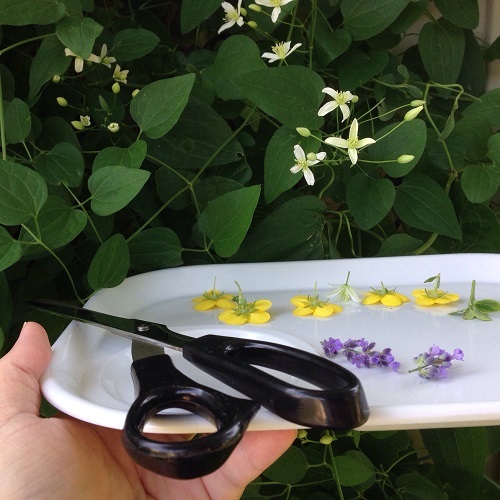 There are different ways to dry flowers. 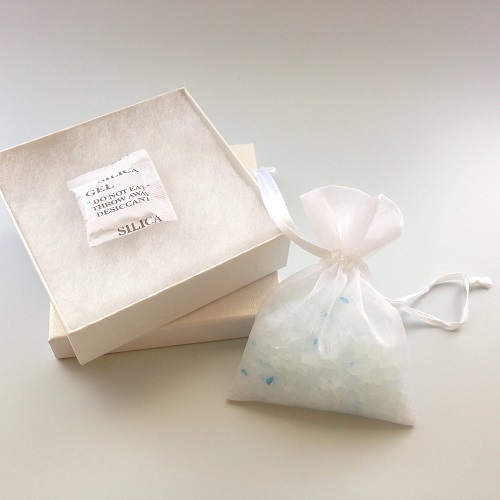 Using silica gel is one of them as it is an excellent desiccant. 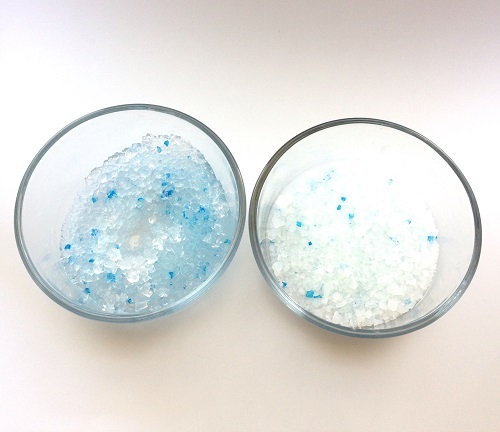 This granular material is made synthetically from sodium silicate which has many industrial and commercial uses. 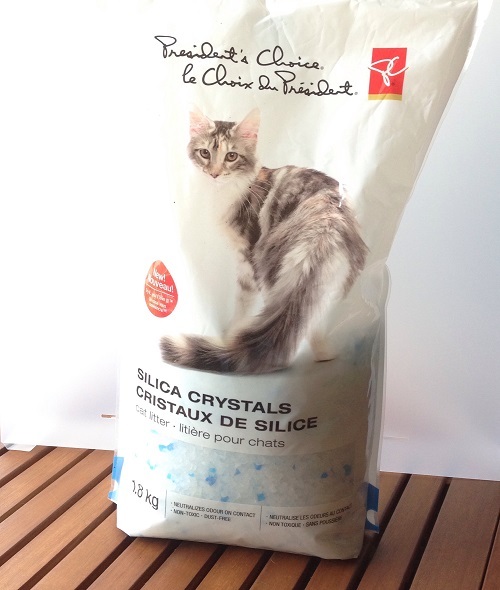 You can purchase silica gel from craft stores like Michaels but I realized there was an easier and much cheaper source of silica gel - crystal cat litter. The silica gel here is additionally dried and screened so there is no dust. There is therefore no danger of silicosis. Although it is a highly absorbent material, I do not use it for my cats as the rough "crystals" don't look that comfortable for their little paws. 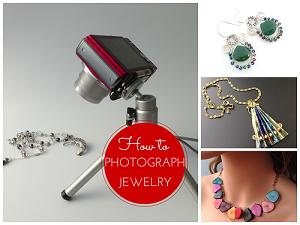 But I was willing to experiment with a small bag for jewelry making purposes! Dandelion clocks are easy to find! My local school field was filled with them because no pesticides are used there. Equip yourself with a bag, scissors and some empty containers with lids to put the clocks in. Be prepared to get some strange looks when you are out foraging! I found just laying the clocks gently in containers partly filled with crystal cat litter worked just fine. You can also collect the unopened clocks. I clipped them as below so that when they puffed up, the clock would be even. I had some on a shelf and some inside a crystal cat litter drying box. Both puffed up within a day. I actually left all the flowers and clocks in their crystal cat litter filled containers for a few weeks but they were dried in less than 1 week because this desiccant is so strong. 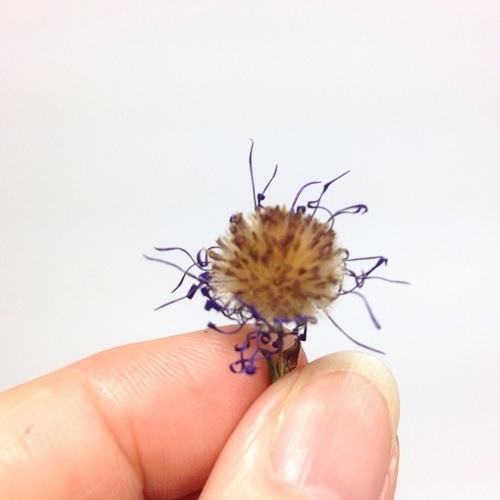 Overall, I found it tricky to dry small flowers this way. 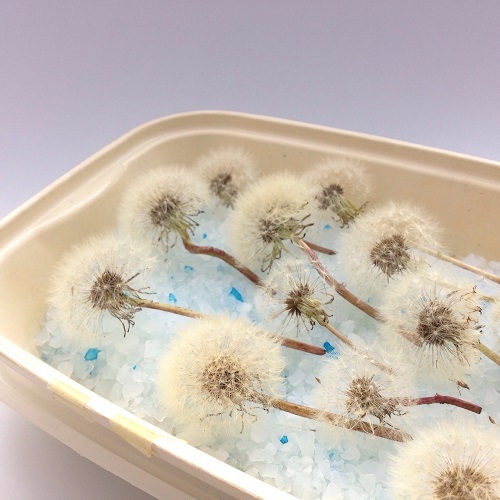 Silica gel works very well for larger flowers as shown in this video of how dried flower arrangements in glass bowls are made. Still, I had a go using flowers from my garden as well as some wild flowers. 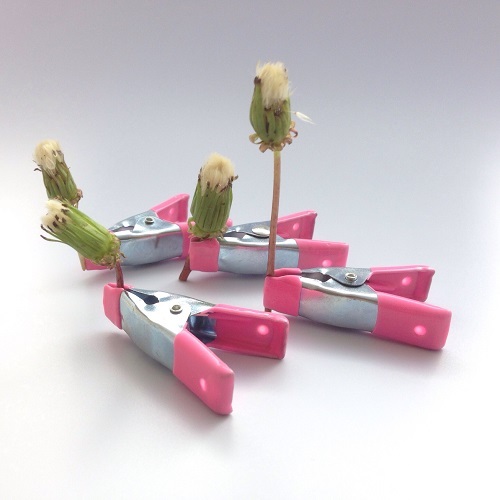 Cut the blooms no earlier than late morning to be sure the flowers are dry and not dew laden. The tiny white 4 petal clematis flowers as well as the yellow potentilla flowers did work as you will see later. 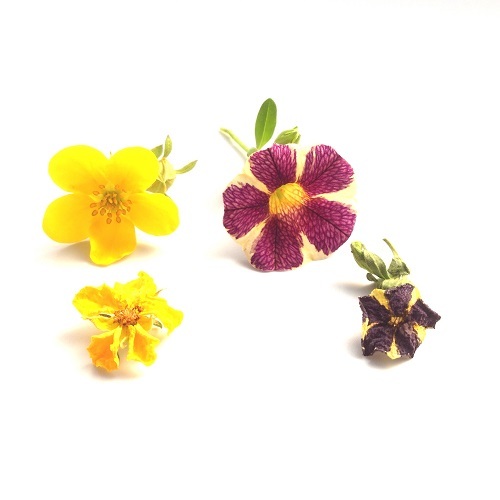 Expect some shrinkage and petal distortion using this method on small flowers. I tried laying the flowers on the silica as well as burying them. But they still shrank in weird ways. So the moral of the story here is to experiment with different flowers and see what works. 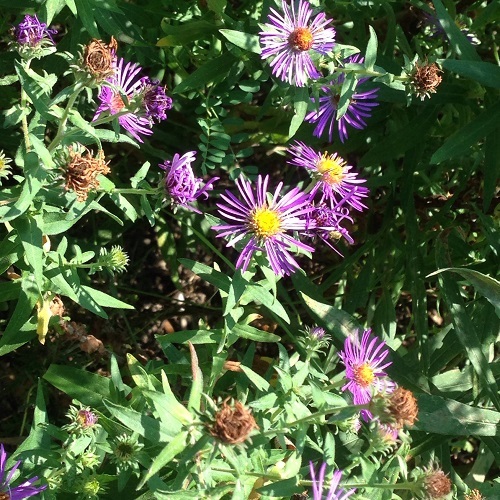 One interesting result came from the New England aster flowers. I found these wildflowers near the school field. The silica really shriveled up the purple petals leaving behind a fuzzy core. I thought it was a fun effect. 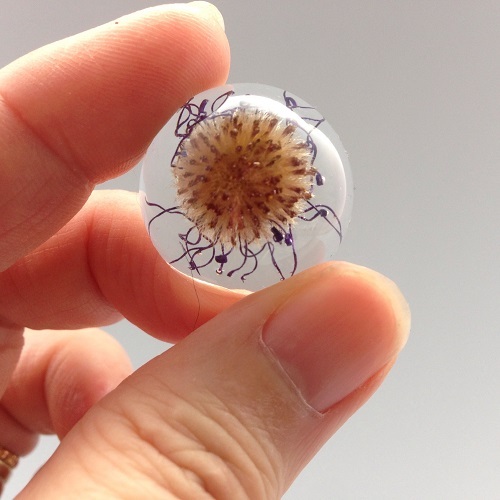 And that's what it looked like embedded in resin. 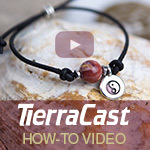 Here is the tutorial on how to embed dried flowers in resin and make resin bezel jewelry. As the cat litter is so cheap, you can have many containers of desiccant on the go. Dry more flowers than you think you need as some of them will inevitably dry unsuccessfully. Or did not resin up properly. There will be a great deal of crystal cal litter left over even after that. 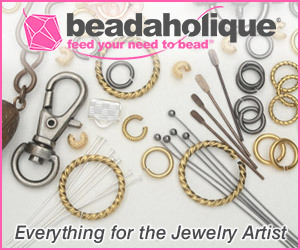 So consider using the silica to keep your finished jewelry dry and retard the oxidization process. 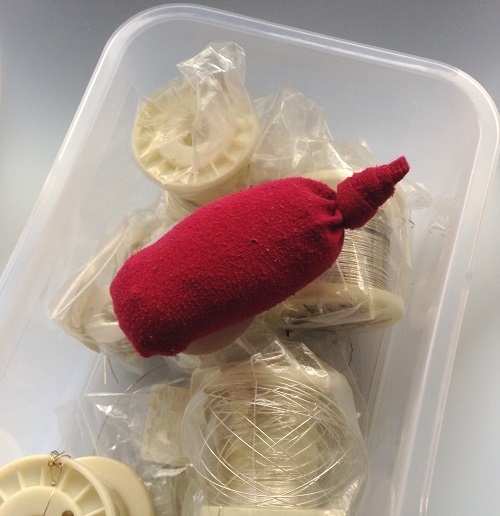 You don't have to save those little silica sachets anymore! Just make your own by sewing up some bags from scrap fabric. Or use inexpensive pouch bags like the one below. I've also used odd socks and filled them with the crystal cat litter to keep jewelry supplies dry. I tossed a couple of them into my unused granular lawn fertilizer bags for the same reason. Best use of socks which survive gobbling up by the washing machine. Use cat litter filled socks to keep your car windows unfogged and the inside of your car dry. Watch this video by Dave Hax who first suggested it. Great tip on how to keep the sock open while you fill it with crystal cat litter. The great thing about silica gel is you can reuse it again and again. When it is too soggy to be efficient any more, just recharge it. Pop it into the oven at 120 °C (250 °F) for 1–2 hours (tip from Wikipedia). The heat will drive the water away. I tried it out by pouring water into the cat litter bowl on the left in the photo below. There was some crackling and popping! The stuff turns translucent when wet. After about 2 hours in the oven, it resembles the dry version on the bowl on the left. Note: The blue bits are just for show. Makes plain silica look pretty! They do NOT have indicators like the silica I used to use in the lab. Laboratory grade silica has additional chemicals (which are toxic) added which change color when it becomes water laden. So we knew when it is time to recharge. What fascinating information!!! Especially about the crystal cat litter and defogging car windshields. Who woulda thunk. 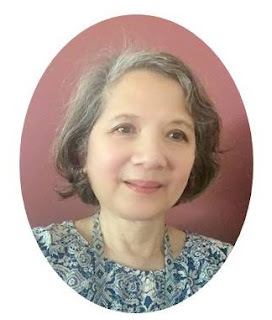 Pearl - I have to laugh at myself because when I first saw you talk about dandelion clocks, I thought how do you put a dandelion embedded in resin on a clock or watch? I never heard the term dandelion clock before. So I just looked it up on Wikipedia and now understand the term clock comes from an old game that children played. They would try to blow the seeds off the head of the dandelion, and the number of puffs it took to get them all off was supposed to be the time. I love it when old stories like this surface. 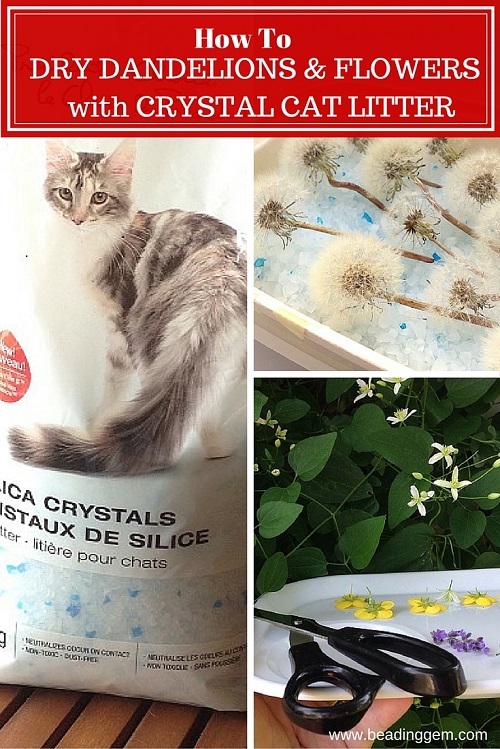 Thanks for sharing all the uses for the crystal cat litter. Now you've got me curious about why dandelion clocks are called Grandpa's flower in Indian and even more curious why they are hard to find in Indian cities. They are everywhere over here. Make sure you get dust free silica gel. 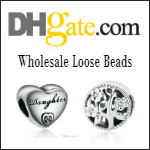 To be safe, get the kind sold in craft stores. What a fun an informational post!! Thanks again Pearl!!! Could you have packed any more bits of information into this one Pearl?? Wowza!! I don't want to tell you how much I've spent on silica from Lee Valley Tools. Plus the shipping second time around when I ran out of the stuff and had more to dry. Yesterday I took dried Sumach berries out of the silica. I like how they've shriveled up after a week in the container. I've always admired The Blue Brick's resin dandelions and other flowers. She was the one who inspired me to start drying the flowers. My lilacs turned out beautifully in the silica. Now to actually make a warm place for the next step - actually doing some resin work. I'm always a tad jealous of people who can do this without having to stand on their heads to keep the resin warm. I will certainly try lilacs next year! 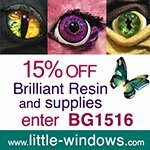 Yes, you need a minimum temperature for resin to cure. Maybe put your molds on a tray and take it away to a warmer place in your house to cure? 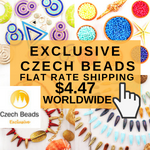 This is some fascinating information! I'm going to have to try this!